When new features are developed or bugs are fixed we will release new versions of the SCK firmware. Connect your kit with a micro USB cable to your computer. Double click the reset button of your SCK, the SCK led should turn green and a new drive called SCK-20 should appear on your computer file browser. Inside the SCK-20 drive you should see some files, double click the INDEX.HTM file and our github releases page will open in your browser. 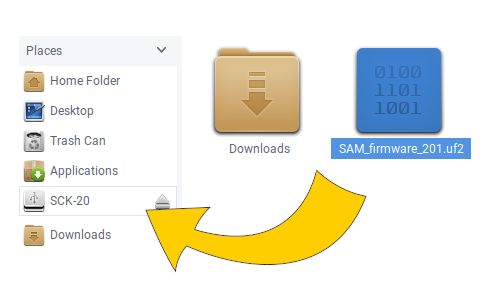 Download the new firmware called SAM_firmware_XXX.uf2 and save it to your computer. You can backup your current firmware version just saving the file called CURRENT.UF2. Simply drag the firmware file you downloaded over the SCK-20 drive, your kit led will blink in green and after some seconds it will reset and start with the new version. 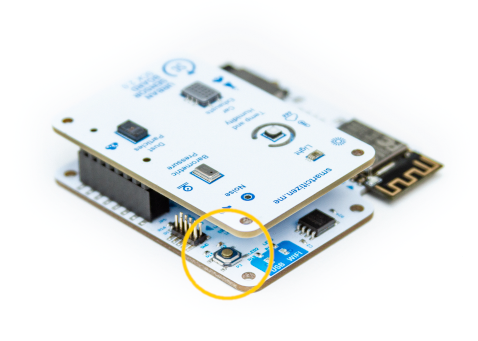 After the update you just done, when your SCK gets connected to the network it will check for an updated versión of the wifi chip (ESP8266) firmware. If there is a new version your SCK will update automatically.